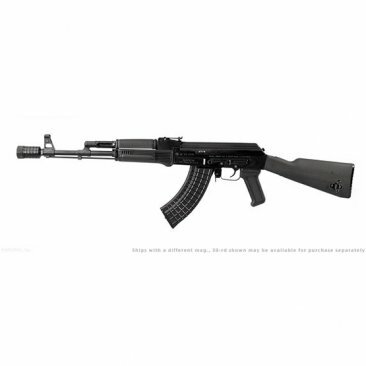 Arsenal, Inc., the premier American importer and manufacturer of semi-auto rifles, is proud to offer to American shooters the Bulgarian-made SAM7R. This 7.62x39 caliber rifle combines authentic, high-quality features rarely seen in the American market. From its intermediate-length trapdoor buttstock buttstock to its Bulgarian 4-piece flash hider, every component of the SAM7R is engineered to provide decades of dependable and accurate service. The SAM7R rifle is bound to become a sought-after shooter and collectible firearm. Arsenals Exclusive Milled And Forged Receiver Each SAM7R receiver is milled from a hot-die hammer forged receiver blank by Arsenal, Bulgaria. Other milled-receiver AKs are machined from bar stock, but Arsenal's hot-die hammer forging produces stronger and finer-grained steel. Internal voids and cooling deformations are eliminated by the 5-ton hammer forging process. Summary: SAM7R-65 | 7.62x39mm caliber rifle, milled and forged receiver, chrome lined hammer forged barrel, Bulgarian 4-piece flash hider, 14mm muzzle threads, cleaning rod, bayonet lug, black polymer furniture, intermediate length buttstock, scope rail, one 10-round magazine, sling, oil bottle, and cleaning kit.